Do you hit a plateau every Tuesday? The weekend’s behind you and the one coming up is too far ahead for you to get excited about. Let the popular online casino, Casino.com put the smile back on your face with a fantastic new midweek bonus, where you’ll have double the fun and double the rewards. 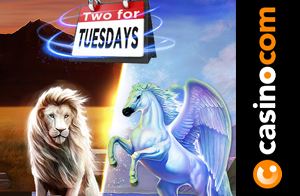 The Two for Tuesdays promotion will have you “seeing double with twice the number of bonuses – every single Tuesday!” according to Casino.com. The promotion includes a cool bonus AND free spins on a selection of epic slot games at Casino.com. The great news is that you can come back next week and enjoy this double bonus all over again. To claim the bonus and free spins, you need to make a deposit of R275 with the bonus code TUESDAY. You then wager the deposit three times on ANY game at Casino.com. The promotion period is every Tuesday until further notice, from 00:01 until 23:59 (GMT). • Ace Ventura slot – An epic branded slot game themed on the whacky vet, played by Jim Carrey in the 1994 movie of the same name. The five reel, 243 ways to win slot boasts famous scenes from the movie and lots of bonus features. Win big with a free games bonus symbol, expanded reels and lots of in-reel features. • White King II – Like Ace Ventura slot, this game is brought to you by the number one software group, Playtech. The game has five reels and 40 pay-lines and is a sequel to the popular White Night slot. Look out for the Majestic Night free games feature and the chance to win up to 5,000 times your stake on each free spin. • Age of the Gods: Ruler of the Sky – Based on the legendary god, Pegasus, this game is part of Playtech’s thrilling Age of the Gods series. Players benefit from stacked wilds on all reels, a Mighty Pegasus Free Games feature with unlimited free spins, and the chance to randomly trigger one of four progressive jackpots.